LONDON – Efforts of the European Union to provide a credible perspective of enlargement to the Western Balkans, as well as the reforms that still lie ahead of the countries in the region, were the main topics at the closed event titled “Beyond Berlin: What Does the Next Decade Hold for the Western Balkans?” hosted by Chatham House on 10 July. 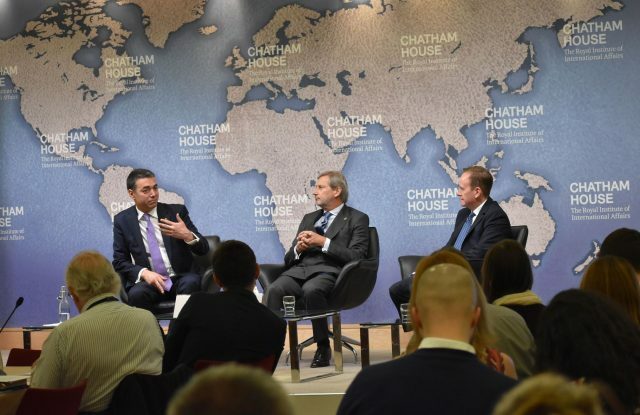 The event was organised in cooperation with European Commission and European Fund for the Balkans, in the context of the fifth Berlin Process Summit, held in London. The opening remarks were given by Minister of Foreign Affairs of the Republic of Macedonia Nikola Dimitrov and European Commissioner for Neighbourhood Policy and Enlargement Negotiations. The introductory speach was delivered by Hedvig Morvai, Executive Director of the European Fund for the Balkans. She highlighted the event as part of the series organised in the context of tenth anniversary of her organisation. Apart from London Summit, Mrs Morvai saw the new European Commission Enlargement Strategy from February, as well as EU-Western Balkans Summit in Sofia in May as signs that the EU is determined to play a more decisive role in giving a credible membership perspective to the region. Minister Nikola Dimitrov expressed his view about the missed opportunities that the whole region experienced in the past, stating that there is no more luxury for making such mistakes. “We do not need to change history or geography, we need to shape the future. That is our approach to the region and our neighbours. Macedonia can not be successful if the Balkans are not successful as well, we do not get anything if our neighbour fails or misses an opportunity”, said Dimitrov. According to him, Macedonia strives towards having strong domestic institutions and becoming an European democracy. Commissioner Hahn also emphasised the importance of the more energetic approach EU has recently had to the region. “I was not sure at the time, but today I am glad that they convinced me that a date is a good idea”, said Hahn, reffering to the 2025 as a potential date for the accession of Montenegro and Serbia. He pointed out that the inclusion of the date caused “actions and reactions” and made the whole process more concrete. “It is in EU’s interest to export stability, not importe instability”, concluded Commissioner Hahn. The opening remarks were followed by a q&a session moderated by Chatham House’s Deputy Director Adam Ward. Afterwards, two additional sessions, titled “Assessing the Track Record of the Berlin Process So Far – Towards a New European Balkans Partnership?” and “Exploring the Role of Non-EU Actors in the Western Balkans – Partners or Competitors?” took place, with the representatives of the EU institutions, civil society and academia taking part.